On Tuesday 8 July 1862, during his successful attempt to cross Australia from South to North, John McDouall Stuart came across a large creek and wrote in his diary, This I have named the Fanny in honour of Miss Fanny Chambers, eldest daughter of John Chambers. Later that day his party discovered yet another river. This time he named it the Katherine River, after the second daughter of James Chambers who had contributed a good deal of money to the expedition. They stayed the night at the Katherine, crossing it the next morning. During the construction of the Overland Telegraph Line, eight years later, the first white people came to the area to work and live. 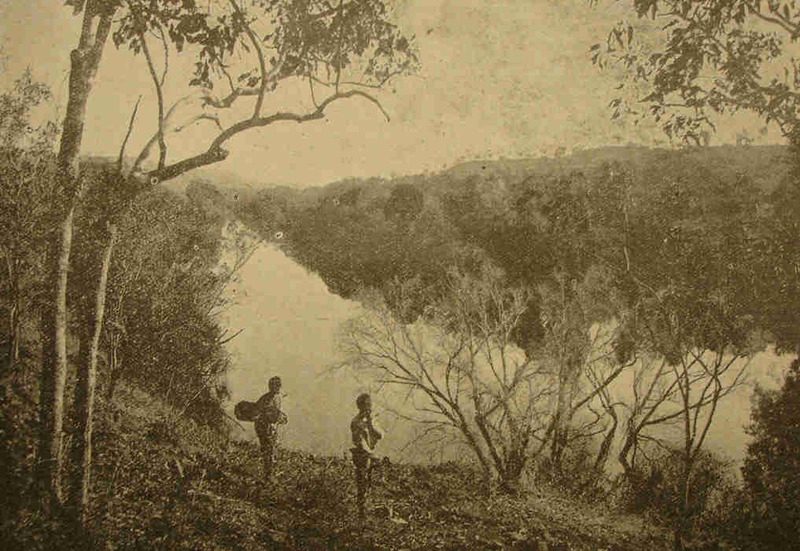 As it was the wet season, the river was flooded and William Frevett Dalwood and Joseph Darwent were marooned with their workers on the riverbanks for about six weeks. Edward Powell died during this time. After completion of the line on 22 August 1872, a four roomed telegraph station was built at Katherine with J.L. Stapleton in charge. He was later killed by Aborigines at Barrow Creek. Among some of the earliest visitors to call at the station were, Dr Harris Browne, Alfred Giles and Robert McKellar Murray. Murray later became station master, replacing C.H. Johnston in 1875. When Murray married, his wife Jane Louisa became the first white woman to live at Katherine. Robert McKellar Murray arrived in May 1875. At the age of ten he had started working for the New South Wales postal services as a messenger boy, working his way up to Telegraph Station Master. When twenty-one he married nineteen year old Jane Louisa Hammond in June 1871. Three years later he was appointed Station Master at Port Darwin and transferred to the Katherine in 1875. He died on February 1893, only forty-three years old. As a result of the early gold discoveries along the line, C.R. 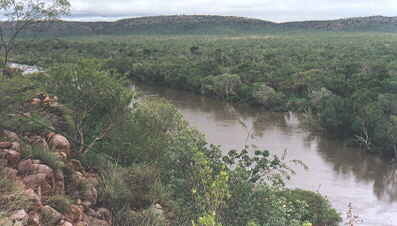 McMinn explored the country around Katherine for gold in 1876 as far as the Flora and Daly Rivers. Very little gold was found but more important was the fact that rich pastoral country was discovered. Another early visitor was Nathaniel Buchanan while droving cattle from Queensland to Glencoe Station. With more and more people settling in the area a Post Office was opened in 1883. The first Adelaide mail arrived on 5 April and was delivered by Charlie Clark. In 1888 Bernard Murphy received permission from Charles Todd to build his Sportman's Hotel and Pioneer Cash store on the Telegraph Reserve for a rental of twelve pounds per year. When a year later, in October the Darwin - Pine Creek railway was completed, travelling in the Top End was made much easier. However the line stopped at Pine Creek for the time being and Bernard Murphy sold his interests to P.R. Allen, who appointed Tom Pearce as manager, and moved to Pine Creek. Tom Pearce became secretary of the Katherine Turf Club in 1895 and William James Henderson was appointed Postmaster and Station Master. Both stayed for a long time at the Katherine. The Sportman's hotel also had many interesting visitors, among them Aeneas and Jeannie Gunn who were on their way to Elsey Station. Tom Pearce married Mary Jennings in 1903 and bought Willeroo Station to breed racing horses. He sold the station in 1915 to Vestey's, who already owned Wave Hill cattle station. The Sportman's hotel was run for several years by ex-Mounted Constable Michael John Kingston and his wife Elizabeth. Tom Pearce, born at Mount Eba Station in South Australia, on 22 December 1862, was well liked and respected in Katherine. During his fifteen years in town he became known as 'Mine Host' in recognition by the locals for the hospitality and assistance they received from him. In 1917 he moved back to South Australia. He died on 9 January 1952 and his ashes were interred at Elsey Station. Ever since the railway had arrived at Pine Creek, locals and most other Territorians, had pushed for the line to continue further south to Katherine. Finally in July 1913 Alfred Giles was asked to be a guide for the Northern Territory railway Commission who were to examine the country for the railway extension. Work was started later that year and completed in 1917 when it had reached the terminus at Emungalan, north of the Katherine River. It was here that Horace Coc, the first station master took up residence. He soon had some company when K.R. Gillard opened up a store. Tom O'Shea built a house, billiard saloon and dining room next to it and Bill Lucy opened a blacksmith shop. Many other families, including several Chinese, also settled at the railway siding. In 1923 a start was made with the building of a bridge across the river. When this was completed the line was extended further south. It meant the end of the short lived excitement at Emungalan as all store keepers moved to the other side of the river. This now became the permanent town and Katherine grew rapidly until 1930 when as a result of the depression railway building was halted. Although connected by railway, the Katherine area was in many ways still isolated from many services. Dr Clyde Fenton who had his practise at Katherine became one of the first Flying Doctors in Australia when he raised £500 to buy a plane for his medical run. He soon earned himself the name of 'Speed Gordon of the Territory Skies'. He later crashed one of his planes at Victoria River Downs Station but walked away from it without a scratch. In May 1969 the Katherine Meatworks burned down, a major setback to its employees and the surrounding pastoral stations. It was rebuild at a cost of $650,000 and has performed even better than before. 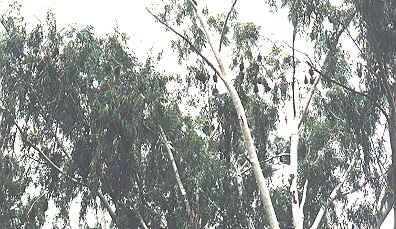 Bats hanging from the trees in Katherine National Park, proclaimed on 8 November 1962. This is hundred years after Stuart passed through the area without seeing the waterfalls.